In the National Portrait Gallery at the moment is a wall of paintings of T S Eliot by Patrick Heron. I rather like portraits of writers, perhaps in the belief, however misguided, that a good portrait can tell us something we didn’t know about the writer, something which the artist can depict which throws new light onto their work. (I realise this is probably romantic nonsense but I can’t help but think it!) 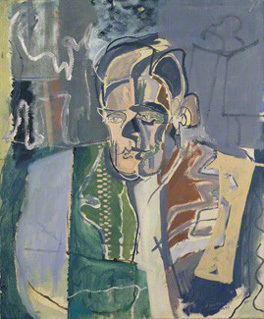 The series of paintings of Eliot provide a fascinating demonstration of how the final portrait (left, 1949) evolved, and indeed of how to paint a poet. After all, Eliot was a complex man, and his work, allusive and intertextual, often dense and sometimes precise, sometimes evasive, requires more than a straightforward portrait. 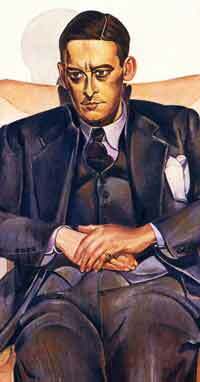 I have to say that I much prefer Heron’s portrait to the Wyndham Lewis portrait (right). Heron’s portrait was produced ‘from memory very slowly, after a period of nearly three years’. Realism or lifelikeness is not the point here, then: Heron’s comment makes it sound as though the idea of Eliot gently brewed in his head for a while before he tried to produce anything, and the result is Modernist, abstract, and yet somehow highly representative of the man himself. Heron’s work is clearly influenced by painters such as Picasso and Braque, moving from pencil sketches and studies from memory to a Cubist version, which is dramatic and expressive as well as appropriate. And Eliot was a man with an interesting face anyway. The final portrait, with its double profile, is much more abstract than earlier versions, though the penultimate Cubist version marks a striking stage in its evolution. His features are emphasised yet distorted, and it is an image one can look at for a long time. You can read about the installation of the display here. For further Eliot immersion, try listening to the poet himself reading The Wasteland. Previous The Man Booker Prize Shortlist is announced! I know, it would be wonderful to draw people at all, let alone from memory! Imagine my surprise, Serena, taking part in an audax bike ride in July when, having started at Oundle in Northampton, the route went into Cambridgeshire and I found myself cycling through Little Gidding! I also like the idea of an inter mingling between the arts (and sciences) – a painted potrait of a writer, a statue of a architect, a biography of an explorer. We enrich all the areas of human endeavour by meeting at the boundaries.